You run into a friend, who just happens to be a fellow t1d mom, and you know instantly that someone else completely understands you? Sometimes in our life, the moments like this are truly the best! The temperatures over the weekend included some pretty substantial heat, somewhat surprising for a Memorial Day weekend. The kind of hot that made you wish you had an in-ground pool. That doesn't seem to bother the girls. Being "cool" kids, my girls rigged up a nice way to stay comfortable and practiced over and over, seeing the opportunity for a heatwave as one to play with any kind of water, even if it came from a faucet. This strategy not only kept them cool but helped their BeeGees (well, their blood glucose actually) to stay in range. A range that weirdly enough is sometimes hard to reach when it is so hot outside. Often, my girls will run HIGH when the heat kicks in. In fact, the range was so good that I often felt torn about how to handle the middle of the night readings. Especially when one popped up at 12:30 a.m. with a 118. Yes, it is a great number. Really great. Unless, you are hoping for sleep. For either of us. So out popped a chocolate milk box and half of it quickly sucked down by a very sleep oldest daughter. Reaffirming my thoughts were subsequent checks at 2:30 a.m. @ 135, 6:00 a.m. @ 107. And the same for my youngest daughter who seemed to have more of a safer range throughout the night, trending into the 170's and staying flat with no worries at all. The milk performed perfectly and helped her to steady and remain stable for the remainder of the night. I just wish that it didn't require so many steps to get there. And does anyone listen to the BeeGees these days? Rejoice fellow parents of loved ones living with type 1 diabetes! The end is almost near. Well, for the school year anyway. Yes, it finally is that time again and I for one, am rejoicing. I can hardly contain myself which makes me feel a little guilty because, should I be celebrating not going to school in front of my kids???? But after having my lovely daughters out of my care for 7-8 hours each day, amassing piles of worry over low and high blood sugars, frantic trips to the school to replace 'ripped out on the playground infusion sites', retrieving test kits forgotten after school, replenishing diabetes supplies including snacks and water on a weekly basis, making emergency plans or fixing plans gone wrong, and just generally hating the idea that I have to send off my babies to manage type 1 diabetes (really it is this way when you think about it) ALL BY THEMSELVES. Oh baby! I am so celebrating the end of the school year (insert sticking out my tongue). We are done June 8th. When are your kids out of school and are you celebrating? Recently, our youngest daughter's class had a scheduled field trip to a local historic farm and one room schoolhouse. Since I drive our children back and forth from school each day, our youngest daughter asked if she would have the opportunity to ride the school bus. Because to an 8-year old, riding a crowded, hot and stinky bus at the end of a long school year is FUN! Hmmmmmmm. I had to think about it for a nano second. In the interest of kids first, diabetes second, how could we work this in? Immediately, the mental list of hurdles to cross appeared in my already overworked brain. 1.) Her aide would not be going on the field trip as I was already scheduled to chaperone. 2.) Who would be responsible if she needed to test her blood sugar and have a snack? 3.) I couldn't ride the bus with her as I needed to leave by 2:30 p.m. to pick up oldest daughter at her school. 4.) Why can't it be easy? And to my surprise, my youngest daughter said, "I can do this Mom. I will test my blood sugar, carry my purse and have a snack if I need one. I will text you everything. I promise." Making it look so very easy. When the day was over and I had time to process the events, I spent a few moments in teary-eyed wonder at the large amount of responsibility and maturity that our kids living with type 1 diabetes have. And I also marveled at how much better of a "texter" my kid is (than me!). I am writing this post on a beautiful Sunday morning at 8:07 a.m., while sipping my coffee and listening to the birds chirp. At this moment, not only am I calm, but happy too. Oldest daughter just successfully completed a slumber party at a house of one of HER friends (instead of mine). Which makes my heart soar to think that in this world, there continue to be families that are open and accepting of our lives. My kids are going to be OK.
That realization isn't from just being invited or attending the sleepover. It is from the mayhem leading up to the full sleepover. The mayhem is really where this story begins. Oldest daughter received her invitation to the party from a classmate that she has known for a few years. While in school together this year, oldest daughter has gotten to know her even better and together, they have formed a nice friendship based on an eclectic mix of sports, make-up and funny stories that make them laugh. I have met the mom a few times and knew that she was a level-headed and relaxed person in the way that only a mom of many girls would be. So although we haven't put together many play dates, I was comfortable with oldest daughter staying the night. Plus, oldest daughter had her trusty cell phone. On the day of the sleepover, oldest daughter and I, set out to write a loose 'diabetes game plan' which would allow freedom to be just like everyone else but to keep mom (me) in the loop of what was going on. Before I go further, I should mention that this party actually had a theme and it was candy. Yes, candy. As oldest daughter pointed out, "If I go low, at least they will have something for me!" 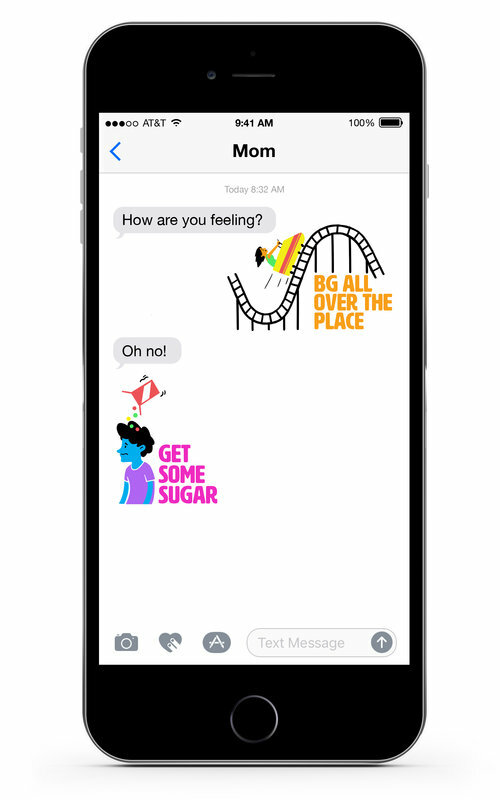 To keep those candy carbs in check, part of our strategy was to have oldest daughter text me with the food she was eating so together, we could count carbs and dose insulin appropriately. Things went smoothly from 4:00 p.m. until around 9:30 p.m.. I was receiving a steady stream of texts from oldest daughter. "We are eating pizza. I am 128. How much?" "How big are the slices?" "Do 20 carbs for each. We'll check in an hour." Shortly, a second barrage of texts appeared. "Having cake. I am 109." "A cupcake size is about 25 carbs." Then, around 9:30 p.m., my daughter texts me that she is eating a bedtime snack and is having something with protein. And after that, I do not hear from her again. By 10:00 p.m., I am completely asleep too. Youngest daughter is home with us, but I know that my lovely husband will be on guard to do the late night check before he goes to sleep. Now, to clarify why I could easily sleep - besides the fact that I am exhausted on a daily basis, is due to part of the plan was to have the mom wake oldest daughter at 2:00 a.m. and check blood sugars. Using foresight, we packed two juice boxes and two chocolate milk boxes as well as a bottle of glucose tabs just in case the middle of the night number required a few extra carbs. At 1:30 a.m., I wake up and flip over my phone. No calls, no messages from oldest daughter. My body is apprehensive and so I walk into my youngest daughters room and do a quick check. 169. Perfect. I relax slightly but then, the realization falls over me that my oldest daughter is not in her bedroom and I can not check her to ensure that she is safe as well. And that moment of realization that this is out of my control is horrible. I swear that this is one of the things that I will need therapy for when the girls are in college. 2:00 a.m., no text or phone call. I will my body to relax and repeatedly remind myself that oldest daughter is fine. Sleep does come but restlessly. By 6:30 a.m., I am unable to contain myself with one sided conversations and I start texting oldest daughter. No answer. My heart beats a little faster and I realize that the only thing that will help this situation is to hear her voice. My husband is now aware that our oldest daughter hasn't texted or called throughout the night and we are both starting to show a little concern. So I bite the bullet and at 7:30 a.m., I call the house and wake up one very tired parent. She is kind and says she will check on Reece and have her call me back. The phone rings in less than five minutes, but it is not my oldest daughter's cell phone number. Instead, it is her friend's phone. A very teary oldest daughter explains that she left the phone at the landing (the girls were outside playing tag in the dark) near the house and realized it after she was in bed. She didn't want to wake everyone up and risk making them upset, so she just dealt with it herself. She did test at 2:00 a.m., but also at 11:30 p.m. and 3:00 a.m.. She had one low 63 and ate a couple of tabs to help. At 3:00 a.m., she said she felt "weird" and tested but she was 130, so she didn't understand why that happened. After calming down, oldest daughter and the other girls went outside to retrieve the phone (thankfully, no rain overnight) and I received a second phone call from a very relieved daughter. And by overcoming the mayhem and staying on track (and let's face it - WITHOUT MOM) well, this is why, I am confident, that she and one day her sister, are going to be fine. Karen at BitterSweet has a 3rd Annual Diabetes Blog Week going on. Today's topic is a great one and is writing about your Diabetes Hero. 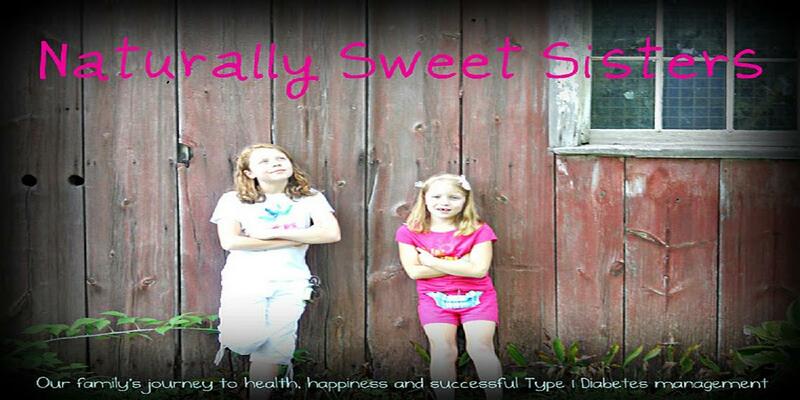 We at Naturally Sweet Sisters have plenty of diabetes heroes. It seems like wherever we look, people living with type 1 diabetes are living life to the fullest. So here is a little roll-call of people (adults) living with type 1 diabetes and their professions in our little town. For my two daughters that are living with type 1 diabetes, meeting these amazing adults has truly left an impression that ANYTHING is possible! Thank you for being our heros! Naturally Sweet Roll-Call of Heros! Eve, Daycare provider and mom to three boys. Joe, Firefighter and dad to two kids. Jennifer, Diabetes nurse and educator and mom to two kids. Mrs. V., Teacher and mom to one son. Kristen, Sign Language Interpreter and mom of three. John, Marketing and dad to two kids. And a great big thank you for all of the wonderful people that we have met who do not live type 1 diabetes but fully accept and embrace it without so much as a blink! We love you! Karen at Bitter Sweet has a blog party happening with all of the t1d peeps in blogville. Today's post focuses on pictures.... she wants us all to come out of hiding and say "hello"! So here is our 2012 Walk to Cure Type 1 Diabetes through JDRF.com. Enjoy and if you would like to donate, please visit jdrf.org and select state of Michigan and team Naturally Sweet Sisters. Karen over at Bitter Sweet is hosting a Diabetes Blog Extravaganza! This week bloggers will come together to post thoughts, feelings, ideas and much more in an effort to raise awareness about type 1 diabetes. Today's post is on What They Should Know. I went back through the Naturally Sweet Archives and found this oldie but goodie and for your reading pleasure, thought it might be a good fit for What They Should Know. A finger poke with a nice blood droplet. A perfectly healed up arm. A sister-to-sister meter race that ends with a tie. A waiter who actually understands why you need an appetizer STAT. A nurse that turns the other cheek when you steal latex gloves in order to create a chicken head. A friend who thinks your pump is cool. A doctor who doesn't emphasize an unattainable A1C. A neighbor who offers to watch your girls for an evening. A loaded carb treat just because you want to. A perfect carb free treat because you want to. A flat line on the CGM. A coach who isn't scared to play you. A teacher who understands the need to wait for an in-range blood sugar. A test strip discovered in a remote place to remind you that others have walked the same path. A day where you forget all about type 1 diabetes. A local bank raised some money and wanted an official JDRF representative to accept the large check. And by large, I mean larger than the official JDRF representative who received it. The size didn't deter her one bit. Anyone else want to write a big check to JDRF on behalf of Naturally Sweet Sisters? We promise to send the cutest JDRF representative to receive it. Thank you 1st National Bank! Karen at BitterSweet has a bloggy week going on. Today's post topic is Fantasy Diabetes Device. What is the one product that you would love to see. A wireless meter/remote with a needle less CGM integrated tubeless pump with I-PAD app enabled technology so that I can log in and read my child's blood sugar history from anywhere and at anytime. Oh, and if the the meter remote could be used with my beloved BIG UGLY test strip drums and a little light for nighttime, that would be great. Really, is this too much to ask for? Karen at Bitter Sweet is holding a Diabetes Blog Week for bloggers to share ideas, heart felt stories and tid-bits about Type 1 Diabetes. If you haven't had the chance, go back and read Post 1 and Post 2. It will knock your socks off. Ok, maybe not but hopefully, you will find some entertaining stories. Today, the topic is One Thing To Improve. While I had to stop and think about the One Great Thing in type 1 diabetes, I had absolutely no trouble in finding something to write about for One Thing to Improve. Isn't that they way we are? Humans are so ultra critical of themselves. First thing that popped into my mind was to continue my efforts in not slacking off or feeling type 1 diabetes burn out. I wrote all about that here. However, the second thing that I thought about was screw the idea that there is One Thing to Improve. Because really, the whole point of why I blog is to let others know that doing your best really is good enough and that we shouldn't let the A1C or my-cat-has-diabetes comments derail us and make us feel less than worthy. Being a pancreas for someone 24 hours a day, seven days a week is hard. Really hard. So maybe the real One Thing to Improve is stop thinking about what you could be doing better and start celebrating the million things that you did perfectly! Karen at Bitter Sweet (which I find so cool as we are Naturally Sweet Sisters) is hosting a blog get together to write about various topics. Today's post is about One Great Thing. Ok, so I had to think about this one for a moment. It is hard to pick out one great thing from the world of type 1 diabetes. Isn't type 1 diabetes the anthesis of one great thing? It sure seems like an oxymoron. They make my life of watching over the type 1 diabetes monster as easy as could possibly be. If I ask them to check their blood sugar, they do it. Maybe with a slight eye roll once in a while, but they do it. They dose insulin for food that they have taken onto their plates and they actually eat those same carbs. There is no hiding or lying. Even when a cookie falls on the ground and then a sister smooshes it with her shoe, they go back into the house and get an equivalent carb item to make up for the difference. At night, they roll over in their sleep, hold out a finger and sip a chocolate milk without the slightest grumble. If they have a playdate, they call me with a blood sugar and always remember to add an "I love you" before hanging up. My job is easy because of them. That is definitely One Great Thing. And did you know that if you are patient, then you can actually walk a cat? If you ask the girls, they would say that is their One Great Thing! Karen at Bitter Sweet is holding a 3rd annual Diabetes Blog Week from May 14th through May 20th. This is an effort to bring all sorts of diabetes families together to share and swap information. Our community is a tight knit group and I, for one, are always glad to meet new friends! Today's topic is "Find a Friend". The idea is to connect online bloggers and readers with one another and to share the bloggy groups that YOU just love to read and interact with. And guess what?! I have a place that (probably) most of you have never visited. Get ready because I am about to share one of the most awesome places with the most amazing group of women. Yeah, it is THAT good! That's it! This group of warm, friendly and passionate advice giving women are some of my very dearest friends in the world. I joined the group right after youngest daughter (then age 3) was diagnosed in 2006, and at the time, the BabyCenter group was in a very different format using out-dated servers. Most of us had dial-up and even though it took an enormous amount of effort to log-in, we always felt so much better, ready to tackle the diabetes monster afterwards. Don't let the name BabyCenter fool you either. 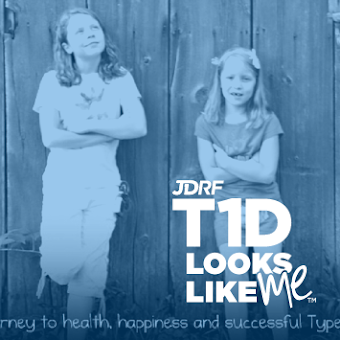 This is a far-reaching group of parents, children and adults living with type 1 diabetes. All ages write posts - from parents of infants to adults living with diabetes for 30+ years. Predominately female, we have had a few dads join in from time-to-time but mostly, it is the ladies that keep the group moving. My cyber girlfriends have shared details of their own struggles and triumphs. New jobs, career changes, personal diagnosis, divorce, new babies. We have held cyber hands when spouses disappointed us, grandparents walked away or children forgot to follow the ever important test don't guess rule. We have cheered for each other when insurance came through, new injection sites tried out or a special recipes for low carb food were shared. We have also managed to keep cyber bullying at bay and to allow the freedom of choosing the personal diabetes management approach that works best for your particular family. After all, we have all learned that diabetes is not a one size fits all. After a short while, we swapped phone numbers and started pen-pal clubs and even had a few face to face meetings if our friends happened to be near our towns. One girlfriend sent Christmas cards to all of us which made me feel as though I was part of her own family. My youngest daughter is now the ripe old age of 8, so we have been part of BabyCenter for over 5 years - which I think is close to 35 in the ever-changing dog years of cyberville. The group was my strength when my oldest daughter was also diagnosed at age 8 (now ten). To have watched the children grow, is my most favorite part of the friendship. Even with new diagnosis added in, the kids with diabetes (and their siblings) remain to be awe-inspiring, fantastic, talented and intelligent group! Truly, a Naturally Sweet group and I hope you get the chance to swing over and say, "Hi!" “But has she the patience?” asks the angel. “And what about her patron saint?” asks the angel, his pen poised in mid air. Can you sell a pancreas at a garage sale? We had a garage sale today. I went into the idea of sorting, organizing, cleaning, tagging and being a salelady, kicking and screaming. Like most of you, this time of year is absolutely overwhelming with the amount of activities scheduled on the calendar. Even with a temper-tantrum (or twenty), I did it. Many clean rooms and a little bit of cash later, I was very glad too. Since this garage sale was held on a Friday, my daughters were at school and unable to hold their usual lemonade stand to raise money for our Naturally Sweet Sisters walk team. Instead, they pulled out a box of crafts that they had been working on since the winter holidays. The box included handcrafted earrings and little tiny rag-a-muffin dolls that youngest daughter named, "Foofies". Before leaving for school, the girls set up a display with a JDRF collection jar and offering their hand-crafted goodies for "free" with donation at the entrance to the sale. For most of the day the jar and the craft items sat; lonely and overlooked. Than a woman in her late 30s came by and asked about the JDRF collection jar. She wanted to know if we participated in the walk. I said we did and we were able to strike up a conversation about type 1 diabetes and mutual friends. She did not have type 1 herself, but had a co-worker who had a daughter diagnosed. After a bit, we realized that I was friends with the co-worker. That lady put a dollar into our jar. A bit of time passed and another man stopped to pause and read the sign. He quietly placed a dollar into the jar too and then, decided he was done with garage sale and walked back down. Only giving a backwards wave when we said thank you. And so it continued. One dollar here or there. Finally, just as we are looking at the last, sad remnants of our sale (most had been sold and tables emptied), a young lady in her twenties came by. She walked over the jar and placed a $5.00 bill inside. She turned to me and said, "I have lived with type 1 diabetes for 25 years and I hate it. All I want is a cure. Maybe after me, the kids will finally have one." This lady had obviously lived with type 1 diabetes in a way that was harder than I could ever imagine. She was down. Her spirit seemed crushed. She didn't look at all like what I remember feeling like in my twenties. She looked sad and tired. Yet, still something remained hopeful. She hadn't given up on a cure. Even after she was done with living with diabetes. And for this single reason, we will always walk. My heart goes pitter patter at the cuteness! Than, add in type 1 diabetes and before you can blink, you are literally covered in white ditto sheets. Inventory slips from all of the mail order pharmacy junk. And, the most important Prescription Copies. Or what we loving call, "Scripts." Let's just focus this post on the scripts, since this week reminded me why it is ever so important to make sure you have copies readily available of this information. There was a newer-ish pharmacist there and having never dealt with her, I was instantly a little leery. Our family carries two insurance policies. The first is a policy that we use from my husband's company and it covers the bulk of our needs. The second is one that we buy for the sole purpose of covering everything the first one does not (like co-pays and deductibles). 99% of the time, our Target Pharmacy gets both policies entered into the system appropriately but once in a while, we have a 1% FAIL. That 1% can really screw us up. The newer-ish pharmacist entered our new scripts as a continuation of the previous scripts, so she did not have to even run the two insurances again. Sounds good, right? Except it wasn't at all what we needed. Our two daughters are consuming about one entire extra vial of insulin per month. This amount was different from the old script to the new script. However, since the newer-ish pharmacist entered it incorrectly, there was no papertrail and my only alternative would be to request a second script from our Endocrinology office. This is where having copies of those scripts and not just blindly turning them over is helpful. Because we made copies for our records, I was able to go back to Target Pharmacy and correct the problem instantly. No need to wait for endocrinology and no need to get upset at the situation. Stress was contained and the problem resolved. While I am chaperoning oldest daughter at 5th grade camp (non-diabetes camp), please enjoy this silly series of diabetes camp jokes! Hopefully you find these "kid" friendly, in good taste (well as can be for jokes) and can share with your little campers. I know my girls are excited to have a few sillies for their summer diabetes camp! What does a meter say to another meter? HI-LO! “Well, of course.” says the salesman. “What do you want?” ask the salesman. “But this is a music store!! !” replies the salesman. The other day my doctor told me I had sugar in my urine. I couldn't wait to go home and pee in my cornflakes. What city has the most diabetics per capita? Needles, California. A nurse at my hospital received a call from an anxious woman. "I'm diabetic and I'm afraid I've had too much sugar today," she said. "Are you light-headed? " my colleague asked. "No," the caller answered, "I'm a brunette". As I downloaded yesterday's blood sugars and looked at my graphs for my youngest daughter, it occurred to me that there is some serious irony at play. Two weeks after our last A1C appt, with NO CHANGES to insulin pump settings, my lovely daughter has PERFECT numbers. No one (and by that, I really mean our endo team) will ever see how good her chart looks. So I am showing it to you! Look! Look! We did it! And even though you see a touch of red or a touch of blue, her numbers have not been low than 65 and higher than 225!!! And she is 5.5 years post diagnosis!!!! Whoohoo!!! But this is truly my point of why we can not let the parent report card get us down. We know what we are doing in caring for our children. There are weeks where we manage to get all of the stars to align and to get that so called "perfect" blood sugar management. Even if no one else sees it. We know. I know. And for the sake of posterity, here is my oldest daughters graph. This is the reality of living with type 1 diabetes and managing that "P" word. But it doesn't make me feel bad for seeing some swings. It just makes me want to try harder. And also to give myself a pat on the back for not seeing more crazy numbers --- puberty is a wild one! 90% of what I write about is from the perspective of a parent raising two children with type 1 diabetes. This topic, however, is one that actually ALL OF US wanted to write about. My husband has played for over three decades and is admittedly a very good player. In fact, so good, that in college, there was a time when he toyed with the idea of becoming a professional and spending his days managing some Midwestern course. Since he is a level, rational sort of fellow, after taking a few finance courses, he decided the best idea was to finish school with a degree that could lead to a professional... just not on a golf course. Since he now works at a university, this sort of thinking has lead to even more advanced schooling and less time for golf. Oh the irony of being a responsible man. With our little ladies now at the ripe age of 8 and 10, we decided to put them into their first series of golf lessons. To be a trooper, I also agreed to sign up for another round of lessons (my, ahem, 3rd time) and a beginner's ladies league to help get additional practice. In this way, during our summer, we can play as a FAMILY. Which is ultimately the plan - allowing our kids to spread their wings (kids first and diabetes second)but still keeping them family oriented. The girls played for the first time this weekend and it was marvelous! The best part? The equipment. One of first decision makers in playing sports is how are we going to tote all of the type 1 diabetes supplies? Where is it going to go? Who will be responsible for it and how will we store it? First thing our oldest daughter said, "I love my new golf bag! Look at the huge pockets for my diabetes stuff!" My husband had to explain that those pockets were usually for things like gloves, extra golf balls and tees. "But hey! Why sure those pockets would be AWESOME for blood sugar meters, low snacks and cell phones!" And those pockets worked out beautifully. Whenever the need to test or have a snack or even just a bottle of water came up, the girls could simply self serve without any hassle. Which brings me to the second best part of playing golf -- down time! During those moments where someone is looking for a lost ball or chipping from a sand trap, or even just putting, there is plenty of time to check blood glucose, even discreetly, and head back out to the game without a moments delay. No one felt like they were missing out or being benched or even letting down the "Coach". The opposite reaction was no one even noticed and nothing was missed. The walking was pretty awesome too. Just the right amount of exercise to keep their blood sugars hovering in the low 100s for most of the day. There was a slight drop in blood glucose a few hours post playing but the drop was gentle enough that the girls caught it around mid 60s and mid 70s. A little snack and they were good to go. There you have it... the magic sport appears to be golf. We'll be playing, I mean practicing, all summer long so if I learn anything else, I will share it with you. And if you see me, try to pretend that I made a good shot!